Gabriel is 13 years old and has Spinal Muscular Atrophy. 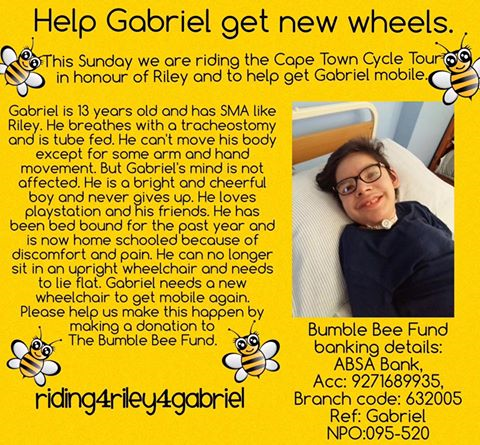 Two of our Cape Town Cycle Tour riders, Andrew and Lisa-Jo Austin, are riding this Cycle Tour for Gabriel and in honour of their son, Riley, who had Spinal Muscular Atrophy Type 1. Gabriel has SMA like Riley had and is in desperate need of new wheels. He can no longer sit in an upright wheelchair and needs to lie flat. He needs a new wheelchair to get mobile again. Please help us make it happen by making a donation to the Bumble Bee Fund using the reference: Gabriel.